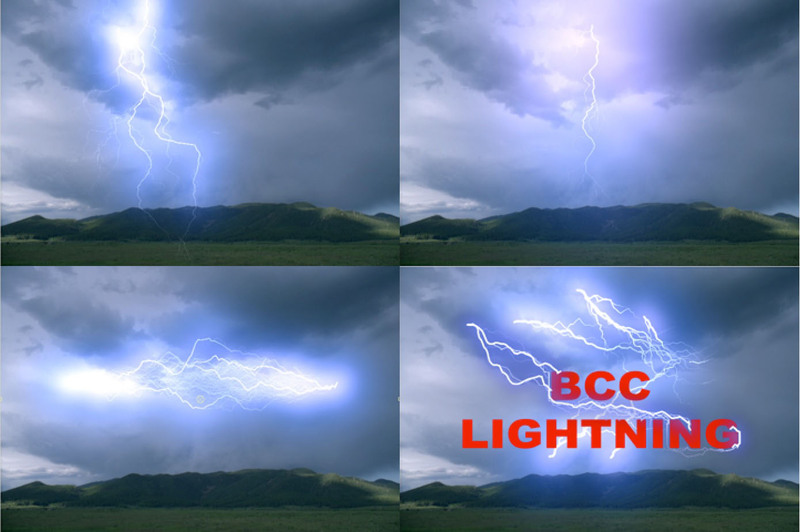 The BCC Lightning filter is designed to generate photo-realistic lightning bolts and plasma streams that will automatically flash or move over the image to which the filter was applied. This filter is based on OpenGL hardware assisted rendering technology and will deliver a high level of performance when paired with a supported graphics card. The filter included parameters to control and shape the overall appearance of the bolt as well as the bolt type and how it will flash or move on the viewer screen. The filter includes many presets that make fast work of setting up the filter; each of the factory installed settings can be modified by the user and then saved as a custom preset, which can be used on any project and from within any supported host. There is also a group called Obstacle Control, which enables the lightning bolt(s) to collide and interact with the alpha or luma channel from any clip that is present in the timeline. Type: This pop-up is used to select the type of lightning and includes the following 6 options. Lightning Number: Amount of bolts. Seed: Sets the random number generator that controls the starting point of the look of the lightning source xy – sets the source point of the lightning strike. Source Radius: Sets the radius of the starting point of the lightning strike – larger values will cause the starting point to move randomly and will also spread multiple bolts along a wider starting arc. Dest XY: Sets the destination point of the lightning strike. Dest Radius: Sets the radius of the destination point of the lightning strike – larger values will cause the destination point to move randomly and will also spread multiple bolts along a wider destination arc. Bouncing Length: Sets the maximum length along which the lightning bolt can travel. Bouncing Count: Sets the amount of bolts that are in the bounce / sheet lightning strike. Width: Sets the width of the lightning bolt core. Color: Sets the color of the lightning bolt and forks. Flash Speed: Sets the speed or frame rate of the lightning pulsing on and off the screen. Flash Amount: Sets the amount of flashing that occurs during the strike. a value of 100 causes the lightning to completely appear and disappear from the image as it flashes, while a value of 0 renders a bolt that is always visible. Core Wiggliness: Sets the amount of turbulence in the bolt core. high values cause the bolt to appear more kinked than lower values. Core Wiggly Amount: used in conjunction with the core wiggliness parameter to control the turbulence in the lightning bolt. higher values cause the bolt to appear more kinked than lower values. Detail: Sets the level of complexity of the lightning bolt. Taper Percent: Sets the position point along the bolt and forks where the tapering begins. Taper Amount: Sets the amount of the visible taper that is applied to the bolt core and forks starting at the value determined by the taper percent parameter value. Used to control the motion of the lightning strike. Oscillation: Sets the maximum width of the arc that the middle of the bolt can swing through. Speed: This sets the velocity of the bolt as it swings through an invisible arc. higher values cause the bolt to move faster than lower values. Strike on: With this parameter enabled, the lightning bolt will move from the start point to the end point over the course of the timeline based on the value set in the duration parameter. Duration: Sets the amount of frames that the strike takes to complete. this is total time of the effect, which includes the strike on and fade off. Used to control the lightning forking. Max Level: Sets the maximum amount of secondary branches that are generated along the bolt core. Max length: Sets the maximum length of any secondary branch off the bolts main core. Max Width: Sets the maximum width of any secondary branch off the bolts main core. Max Density: Sets the amount of tertiary branches that are generated off of the secondary branches. Max Angle: Sets the maximum angle that any branch can take. Wiggliness: Sets the amount of turbulence in the branches. High values cause the bolt to appear more kinked than lower values. Wiggly Amount: Used in conjunction with the core wiggliness parameter to control the turbulence in the branches of the lightning bolt. Higher values cause the branches to appear more kinked than lower values. Used to control the glow of the lightning bolt. Inner Width: Sets the width of the inner glow. Inner Color: Sets the color of the inner glow. Inner Opacity: Sets the opacity of the inner glow. Outer Width: Sets the width of the outer glow. Outer Color: Sets the color of the outer glow. Outer Opacity: Sets the opacity of the outer glow. Obstacle Amount: Sets the amount of pixel information from the selected channel (alpha or luma) that is used by the lightning. Luma Threshold: Sets the 50/50 point of the channel that is being used as an obstacle map for the lightning bolt to run around. Obstacle Layer: Pop-up that determines what layer is used as an obstacle for the lightning bolt. Mix with Original: Blends the effect with the clip to which it was applied. Source Alpha Check box: Enable to composite using the original clip’s source alpha. disable to ignore the image alpha channel. Apply Mode Pop-up: Sets the apply mode of the filter as it is composited over the original clip. Apply Mix: Blends the apply mode selection back with the normal apply mode. a value of 100 does not blend and just uses the chosen apply mode, while a value of 0 blends the selected apply mode back to 100 percent normal.